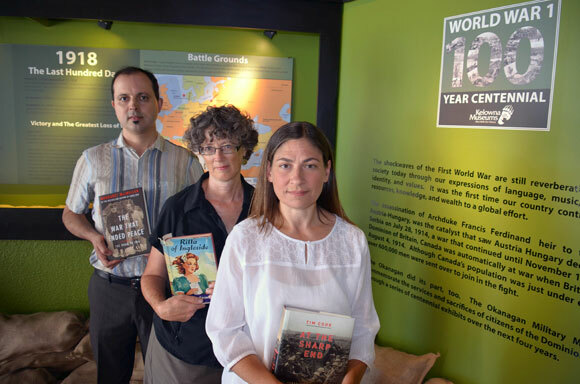 Anderson Araujo, Nancy Holmes and Lisa Grekul, seen here at the Okanagan Military Museum, will give presentations marking the 100th anniversary of the First World War at the Canadian War Museum during a conference from July 31 to August 2. The University of British Columbia Okanagan, the University of Ottawa, and the Canadian War Museum are marking the 100th anniversary of the beginning of the “war to end all wars” with a conference on Canadian war literature and a distinguished speakers series in Ottawa, July 31 to August 2, 2014. For nearly a century, Canada’s role in the First World War has elicited a range of critical and literary responses. Academics, writers, and journalists are meeting for the Canadian Literature of World War One International Conference at the University of Ottawa to examine, debate, and celebrate this literature. Nancy Holmes, associate professor of creative writing and poetry, will talk about girls’ novelist Lucy Maud Montgomery and her war poetry. 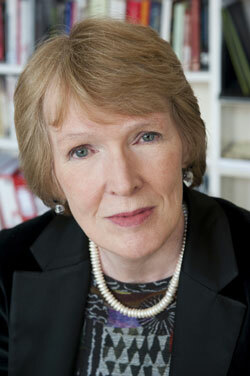 Author Margaret MacMillan gives a free lecture Friday August 1 at the Canadian War Museum. In conjunction with the conference, drawing attendees from across the country and Europe, three distinguished speakers will give free public lectures. Tim Cook, historian at the Canadian War Museum and author of several acclaimed books on both world wars, opens the series and the conference at 7 p.m., Thursday, July 31, at the Canadian War Museum with a talk, “Canada and the Commemoration of the Great War, 1918-2018.” Cook’s books include Clio’s Warriors: Canadian Historians and the Writing of the World Wars and At the Sharp End: Canadians Fighting the Great War 1914-1916; Shock Troops: Canadians Fighting the Great War 1917-1918, which won the 2009 Charles Taylor Prize. Friday, August 1’s lecture will be given by Margaret MacMillan, the Oxford University historian whose book Paris 1919: Six Months That Changed the World, became an international bestseller. In time for 100th anniversary of the First World War, her much-anticipated book about the origins of the war, The War that Ended Peace: The Road to 1914, has been recently published. MacMillan’s talk, “The Great War in Literature,” is at 7 p.m., August 1, at the Canadian War Museum. The authors’ books will be for sale at each event. There will also be presentations on a variety of Canadian writers whose work covers the wartime period, including Joseph Boyden, Timothy Findley, Stephen Leacock, Charles Yale Harrison, and L.M. Montgomery, as well as papers on key issues such as memorials, trauma, journalism, and women during the war.